Floor graphics are short to medium term graphics that appear on the ground in locations including supermarkets, trade shows, retail stores, and more. Floor graphics must meet U/L 410 requirements to ensure that they do not pose a slipping hazard. Floor graphics are typically created by using a self-adhesive media protected with a floor graphic laminating film or by applying a laminating film and removable mounting adhesive to a basic paper print. The laminating film applied to a floor graphic must be durable in order to stand up to foot traffic and basic cleaning. 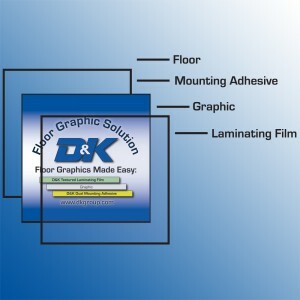 D&K manufactures a textured vinyl film range specifically designed for floor graphics. These films feature a textured finish to reduce glare and slight blue tint that helps prevent graphics from yellowing. Floor graphic films can also be cleaned and waxed along with the surrounding floor. Floor graphic adhesives are designed to be removable from vinyl tile floors up to a period of six months. This allows graphics to be easily changed without damaging the floor below. Floor graphic adhesives are available in clear or opaque versions that help block out colored flooring beneath the graphic. Floor Graphic Laminating Films:- These protective floor graphic laminating films meet U/L 410 requirements for floor graphic slip resistance. Floor Graphic Adhesives:- These adhesives are designed to adhere to vinyl floors and are ideal for short to medium term floor graphics. Copyright © 2014.D&K Group, All Rights Reserved.